I love to use frozen fruits and berries in the middle of winter. It really makes me feel like a bit of summer is in the house. 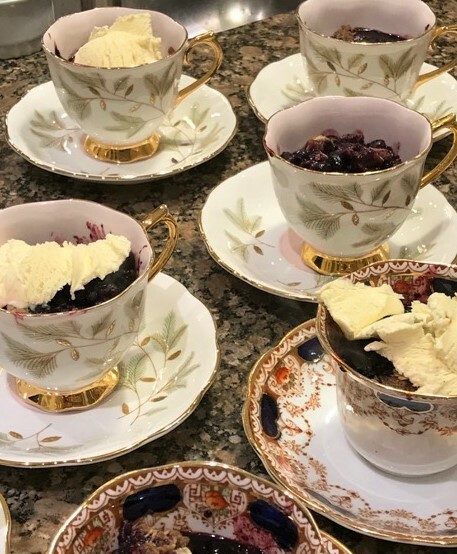 To glam this blueberry crumble up serve it warm in tea cups with a small scoop of vanilla frozen yogurt or ice cream your call. Preheat oven to 350° F (180° C). Line an 8-inch square (2-L) baking pan with wet parchment paper, set aside. Place the berries into the prepared pan. Sprinkle evenly over the top with the tapioca, lemon juice, and cinnamon. Set aside. In a medium bowl stir together the oats flakes, whole wheat or oat flour, oat bran, brown sugar and cinnamon. Using a large spoon mix in the oil until well combined. The mixture should look wet. Pour topping over the berries. Press down lightly. Bake for 60-70 minutes (see note below) or until the blueberries are bubbling and the topping is a deep golden brown. Serve warm or cold. Will keep up to two days covered in the fridge. If you want to speed up the baking time, thaw out the berries first. Place berries in the prepared pan and let sit on the counter for up to 3 hours to thaw. Then sprinkle with the tapioca, lemon juice, and cinnamon. Continue on with Step 3. To make this gluten free use gluten free oats, gluten free flour and omit the oat bran, unless you can find gluten free oat bran – its harder to source at a grocery store. Add an extra 1/2 cup of gluten free oats if eliminating the oat bran. I buy gluten free oats and oat flour at the Bulk Store. The brand I use is Canadian out of Saskatchewan, I don’t work for them, I’m just a fan – its called only oats. I served this dessert at a fundraiser for New Circles, a charity supporting new Canadians, to raves. The tea cups in the picture belong to the hostess, and were so pretty.